AUSSIE sporting icon Bruce McAvaney is going out with a bang. 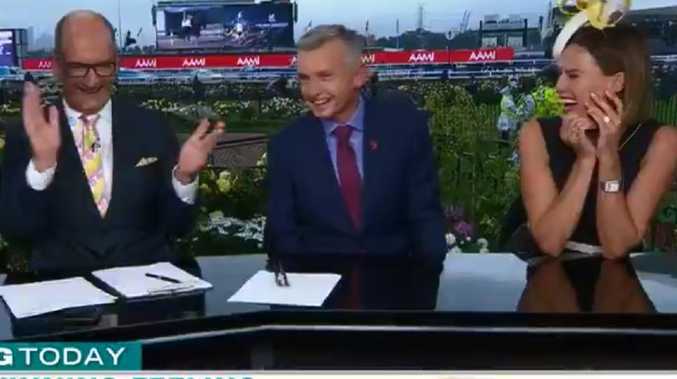 The legendary caller left Sunrise hosts David Koch, Sam Armytage and racing identity Francesca Cumani in stitches on Tuesday morning when he performed his customary phantom call of the race that stops the nation. The 65-year-old racing tragic confirmed earlier this week Tuesday's Cup will be his last as a commentator. He's still as sharp as ever - as shown by the hilarious reaction surrounding his predictions for the big race. The Seven identity has actually tipped favourite Yucatan to win the $7.3 million race, but called home eccentric billionaire owner Dr Marwan Koukash's runner Magic Circle during his phantom call. "Hang onto your G-strings," McAveney called when asked to predict the final dart to the line. "Hold onto your G-string because we're at 200 to go and Yucatan's taken the lead from Avilius. Who Shot Thebarman's coming home hard. And here's Magic Circle. Oh No, Yucatan, just in front of Avilius. Magic Circle goes up. They get to the line. Oh, it's a photo finish. It's Magic Circle by a G-string." Koukash famously declared during Saturday's barrier draw that he will strip down to a G-string and strut around Flemington when his horse claims the Cup. McAvaney quipped it will be interesting to see if Victoria Racing Club (VRC) officials try to stop him. "I think we'll see something like we've never seen before - an owner gelded on Melbourne Cup day," he said. Melbourne Cup 2018: How to make a bet: How to bet on the Melbourne Cup.